"Rudram (रुद्रम)" is an upcoming limited episode triller marathi serial which will go on air from 7th August 2017, Monday to Friday at 9:30 pm on "Zee Yuva" channel. 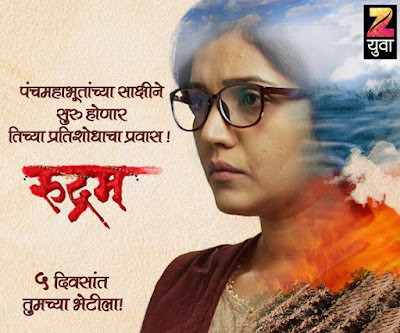 The serial star actress "Mukta Barve" in a lead role, after a longtime she will be seen acting on a television, other actors in a important role are Kiran Karmarkar, Vandana Gupte, Satish Rajwade, Mohan Agashe, Sandeep Pathak, Mitali Jagtap, Suhas Palshikar, Vivek Lagoo, Suhas Shirsat, Sai Ranade, Anirudha Joshi, Milind Phatak, Sunil Abhyankar, Anand Alkunte, Kiran Khoje and Ashish Kulkarni. 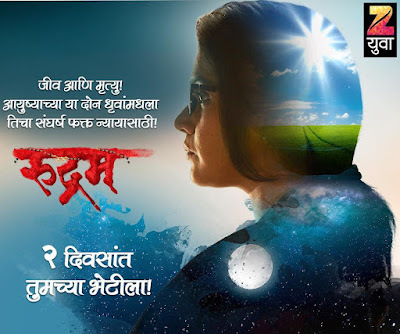 Rudram serial story is written by 'Girish Joshi', directed by 'Bhimrao Mude' and produced by Nikhil Seth, Vinod Lavekara and Sandesh Kulkarni under the banner "Potadi Entertainment". The story of the serial revolves around Mukta Barve a simple family woman, for whom her family is the whole world, where she is living a happy, safe and secure life with her family and one day suddenly when something unexpected happen in her life, where her whole life get ruined, and then this simple woman traps the safe boundary around her and traverses injustice.